All PhD students are required to complete graduate-level coursework; conduct advanced independent research; complete a doctoral dissertation; and successfully pass a Qualifying Exam, General Exam, and Final Exam. Total Credits: PhD students are required to complete a minimum of 90 graduate-level credits. All required courses (other than research credits) must be numerically graded. Enrollment: PhD students are expected to maintain full-time enrollment of at least 10 credits per quarter. Initial Advising Appointment: In order to plan for courses and degree requirements (below), incoming students should meet with their academic advisor(s) before the start of their first Autumn Quarter -- at least two weeks before classes begin. PhD students register through MyUW. For more information please refer to the UW Student Guide. Registration dates and deadlines can be found on the campus Academic Calendar. After meeting the requirements of their specific degree pathway (1), all PhD students will complete the same series of exams and research requirements (2-6). MSAA, Graduate Fundamentals, or Post-Master's "Doctoral Residency" Credits: The first one to two years of the PhD program will be organized based on the degree pathway a student chooses, with guidances from her/his research advisor. Qualifying Exam: The Qualifying exam should be taken as soon as possible after completing previous pathway-specific requirements (i.e., MSAA, fundamentals, doctoral residency). Establish Doctoral Supervisory Committee: Doctoral Supervisory Committees should be established as soon as possible after the Qualifying Exam. At the latest, the committee must be in place the quarter before the General Exam may be scheduled. "Doctoral Coursework": After successfully passing the Qualifying Exam and establishing a Supervisory Committee, PhD students must complete additional coursework (9 credits minimum) to prepare for the remainder of the PhD. Students should consult directly with their faculty advisor to determine which courses to take. These courses should serve to prepare the student for passing the General Exam as well as developing and completing a doctoral dissertation. General Exam: When ready to focus primarily on dissertation research, students must undertake (and pass) the General Examination under the supervision of their Doctoral Supervisory Committee. General Exams are to be take at least one year after the Qualifying Exam and at least one year before the Final Exam. Dissertation: After successfully passing the General Exam, students become "PhD Candidates" and are expected to work full time toward completing their doctoral dissertation. While completing a dissertation, students must enroll in AA 800, "Doctoral Dissertation" (27 credits minimum). Final completion of the dissertation will require identifying a Doctoral Dissertation Reading Committee. Final Exam: When a student and her/his committee are satisfied that the dissertation has been successfully completed, the student must schedule and pass the Final Exam. Final Exams should be scheduled at least one year after the General Exam. Many students choose to complete an MSAA en route to their PhD. With appropriate planning and progress, completing an MSAA en route to a PhD does not usually extend a student's time-to-degree. To pursue this option, students should plan to complete all MSAA degree requirements. PhD students completing an MSAA are encouraged to complete a master's thesis and to complete most of their MSAA coursework before taking the Qualifying Exam. 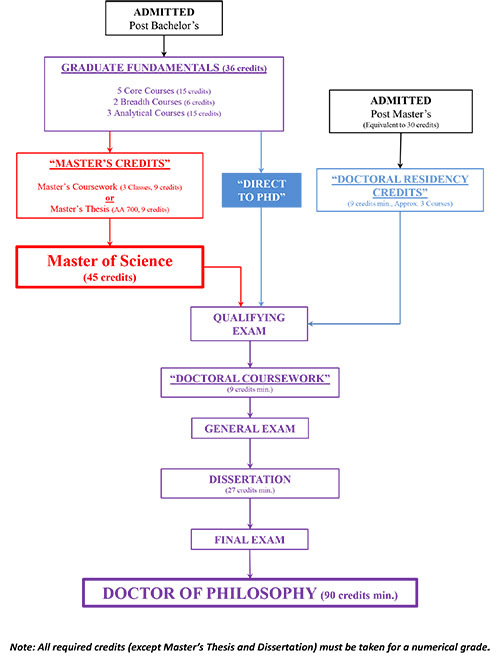 Students who do not wish to complete a master's degree en route to the PhD, can pursue the "Direct-to-PhD" path. Direct-to-PhD students will complete the same "graduate fundamentals" as MSAA students. However, they will not complete a thesis and will not receive a Master's degree from our department. Direct-to-PhD "graduate fundamentals" must include the following major components for a minimum of 36 credits. *Direct-to-PhD students are advised to refer to the pre-approved MSAA concentration courses for guidance when choosing depth courses. However, doctoral students should work directly with their faculty advisor to identify the depth coursework that is most appropriate for their field of study and research. PhD students who are explicitly granted "post-masters" status are not required to complete "graduate fundamentals" courses. Post-master's students must complete a minimum of 9 "doctoral residency credits" before undertaking the Qualifying Exam. Post-master's students should consult with their faculty advisor to determine which courses should be taken. These courses should serve to acclimate a post-master's student to our department and to prepare for taking the Qualifying Exam. To receive Post-Master's Status, a student must first meet with their faculty adviser and review the master's degree previously completed. This is an important opportunity to confirm a shared understanding of the student's previous work. The faculty adviser's endorsement is a requirement for Post-Master's status. After meeting with their faculty adviser, the student must complete a Petition for Post-Master's Status (including faculty adviser signature and an unofficial copy of the master's degree transcript) and return it to the Graduate Adviser. The department Graduate Committee will review all requests. The Graduate Adviser will follow-up with the student to implement the final decision with the Graduate School. Pending final approval from the Graduate School, students with Post-Master's status will receive a waiver of 30 credits toward the 90 credits required for a PhD. Students are generally expected to take the Qualifying Exam during their second year in the PhD program. Doctoral students who do not pass the qualifying exam by the end of their third year of graduate study will be subject to unsatisfactory progress policies. Overall readiness to engage in independent research and complete the PhD program. Responses to questions from the committee and faculty members present. Review the Qualifying Exam detailed departmental policies and procedures carefully and well in advance of scheduling your exam. A Doctoral Supervisory Committee committee should be established as soon as possible after successfully passing the Qualifying Exam. At the very latest, the committee must be in place the quarter before the General Exam may be scheduled. The Chair of a student's Doctoral Supervisory Committee must hold an appointment in the A&A Department. (Adjunct faculty appointments are sufficient.) Students must notify the department's graduate program advisors as soon as they have their committee membership finalized. 5. Graduate School Representative (GSR). The GSR cannot hold an appointment of any kind in the department. Please see the Graduate School website for additional details regarding doctoral committees. Students should plan to take their General Exam at least one year after passing the Qualifying Exam. Students must also complete a minimum of 60 credits of graduate-level work (including a minimum of 18 numerically graded 500-level credits) before a General Exam may be scheduled. 2. Submit a Research Proposal to all members of the committee. The proposal (at least 20 pages, double-spaced) should include a statement of research objectives, a review of prior and foundational work in the area, any preliminary research already completed, and a clear plan for completing the proposed research project, including a timeline identifying key milestones and dates. Please see the Graduate School website for additional details regarding scheduling a General Exam. The General Examination itself is an oral exam of about two hours' duration. It begins with the student's presentation (typically 30-40 minutes) followed by questions. The General Exam It is not a presentation of completed research as the student’s final research may indeed change. Presentations and general questioning are open to the public followed by a closed examination session limited to the student and the committee. After passing the General Exam, students are officially acknowledged as "PhD Candidate" and will receive a candidate certificate from the Graduate School. After passing the General Exam, PhD Candidates are expected to focus primarily on completing their doctoral dissertation. The dissertation requires a substantial effort and must demonstrate original, independent research and achievement. Candidates are strongly encouraged to maintain consistent contact with their doctoral committee members (especially the chair) throughout the research and writing process. Working closely with their committee can help avoid delays as students prepare for the Final Exam. In addition to having a general Doctoral Supervisory Committee, PhD students must also identify a dissertation Reading Committee that is responsible for final review and approval of the dissertation document itself. The Reading Committee should be comprised of three to four members drawn from the Supervisory Committee. Please see the Graduate School website for additional details regarding Reading Committees. When the dissertation project has been successfully completed, it is the student's responsibility to make preparations for a Final Examination. Final exams should be scheduled at least one year after the General Exam and all PhD requirements (including a minimum of 90 graduate-level credits) must be completed before a Final Exam may be scheduled. When a candidate and her/his advisor believe the candidate is ready to proceed to the Final Exam, the candidate must submit a complete copy of the dissertation to the whole Supervisory Committee. At this time, candidates should coordinate with committee members to identify a mutually acceptable date and time for the exam. Students are strongly encouraged to undertake the Final Exam on/before the last day of instruction. This allows a minimum of one week for edits and revisions before the complete dissertation must be submitted to the Graduate School. At least two weeks before the intended exam date, students must request to schedule their Final Exam via MyGrad. It is the candidate's responsibility to schedule a time and location to ensure that, at the very least, the minimum required number of Supervisory Committee members will attend. 3) All members of the Supervisory Committee have agreed that the student is prepared to proceed to the Final Exam. The Final Examination itself is a presentation and defense of the dissertation. The Exam should last approximately two hours total and consist of an presentation from the candidate (approximately 30-40 minutes) followed by oral examination. At least four members of the Supervisory Committee must be in attendance, including the Committee Chair, GSR, and one member of the Graduate Faculty. Presentations and general questioning are open to the public followed by a closed examination session limited to the candidate and the committee. The department will notify the Graduate School of the outcome of the Final Exam. Please see the Graduate School website for additional details regarding Final Exams. After successfully passing the Final Exam, students must complete several final steps before graduating. The student and all members of the Reading Committee must sign the Doctoral Dissertation Reading Committee Approval Form. Complete the required Survey of Earned Doctorates before the last day of the quarter. The student must submit (1) an electronic copy of her/his final dissertation and (2) the Reading Committee Approval Form through the "Electronic Thesis/Dissertation (EDT) Administrator Site" by 11:59pm on the last day of the quarter. Please see the Graduate School website for additional details regarding submitting your dissertation prior to graduation. All library books must be returned and all outstanding fines/fees paid before students will be allowed to graduate. Graduating students must provide a reliable mailing address before graduating. This is the address where you will receive important materials such as your diploma. Addresses and contact information can be updated via MyUW. Diplomas and are typically available 10-12 weeks after the end of the quarter in which the PhD is awarded.